Birds swoop, flutter and perch among the poems in London Grip’s summer selection. 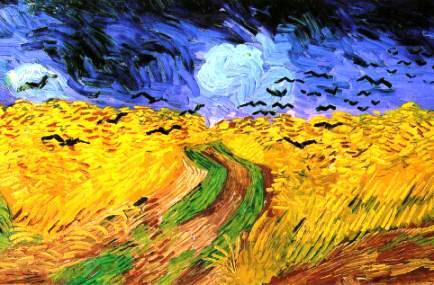 Some are dark and ominous as the crows in Van Gogh’s fatal cornfield; but there are also colourful parakeets and a loquacious goldfinch. Once we start to look, we can see how different kinds of birds relate to the emotions that poetry explores. Soaring eagles stir admiration and wonder; yet a carrion-eating vulture at close quarters arouses disgust. A dawn chorus can bring hope ; a nightingale’s song offers a sense of calm and peace. Brightly-coloured natural mimics like mynahs or macaws provoke delight and laughter. Even the most innocent of small birds can give a small pang of fear by bursting from a hedgerow as we enjoy a country walk. And, like uncontrolled emotions, birds can cause full-blown panic if they stray indoors and beat confined, domestic space with urgent wings. Several of the poems in this issue of LG New Poetry could be classed as visiting migrants. We have contributions from poets originating from or based in Canada, New Zealand, Poland, Spain, Switzerland and the USA. Our first foreign-language poem is by the Spanish poet Amado Storni; and it appears alongside a specially-composed English version. Readers might like to respond to this – or to any other feature of London Grip poetry – by using a comment facility which follows the last poem in this posting. I am grateful to all contributors for sending me so much enjoyable and challenging work. And I am grateful too for the interesting email discussions that sometimes follow from my comments or suggestions about some aspect of a poem. On a more personal note, I’d also like to take this opportunity of thanking the many readers who sent me good wishes for recovery from the broken leg I sustained through being run over by an example of the native British and ubiquitous white van; I am pleased to report that I am making good progress. the milliner, laid out in stone. from the life of Christ. and his tiny sanctuary slippers. Kerrin P. Sharpe is a teacher of creative writing. She has recently been published in Best NZ Poems 08, 09 and 10, and The Best of Best NZ Poems. Her first collection will be published soon. coming in low on undertakers’ coat-tails. Years since we came to church. Pippa Little is Scots, born in Tanzania, raised in Scotland and now lives in Northumberland. Recipient of an Eric Gregory Award, The Andrew Waterhouse Prize, The Biscuit International Poetry Prize and The Norman MacCaig Centenary Poetry Prize. Her work has appeared in many anthologies, text journals and online. Her collections include Foray (Biscuit Press, 2009), The Snow Globe (Red Squirrel, 2011) and Overwinteringwhich is due from Oxford Poets/Carcanet in October 2012.
had marked him for a book of psalms. aided by a gargle of communion wine. with God slurred in a burning Kyrie Eleison. Maria Taylor is a poet and reviewer of Cypriot origin. Her poetry has appeared in publications including, The North, Staple, The Guardian and others. Her debut collection Melanchrini is out with Nine Arches Press in July 2012.
as laughter shivering the trees. themselves upon us, insist we don’t forget. remembers nothing,  no eyes, no shapes. how we etched memory in the air. The trees imprison me, rigid wardens. as long as they are watching. and in daylight, crowd the glass with shadows. my sightless eye, my hardened cheek. The bars caress my face, a grid of days. that shows us where we are: I am here. Tamar Yoseloff’s fourth collection, The City with Horns, was published by Salt in 2011 (a London Grip review by Chris Beckett appears at https://londongrip.co.uk/2011/11/poery-review-winter-2011-yoseloff/). She has recently published the poem Desire Paths, a limited edition with woodcuts by Linda Karshan printed by the Galerie Hein Elferink (Netherlands). The poem above is from the pamphlet Formerly, with photographs by Vici MacDonald, to be published in June 2012 by Hercules Press. that we never walked together? known in the dark, suspended over the river. can we find our way? and see what you can see. and the odour of the gods. although they have at last closed the border. No more crossings. Their dogs will talk to us. is large. How can they keep everyone in? is a movable feast under each sun. which edge of the border jigsaw we fit on. about strokes, wheelchairs, and old women. My sister died in these woods two days ago. a campanile, no church that we can see. who will let us board a bus or train quietly. selling these things could have flown us out. Now we shall have to take our chances here. First we have to steer Nana down this slope. left as crow meat for professing his faith in public. & wallet shouted this news up to our window. We packed one bag each before the Offical Visit. Now we will see how far our faith takes us. big hat no cattle gets you sent to Calgary. unclaimed by wolves or hibernating bears. if the plane crashed and we survived. waving his wine jug shouting Go! Go! and still does to travellers heading West. Brian Docherty lives in north London and is a member of Word for Word Writers Group. Woke up this Morning (due from Smokestack Books, Oct 2012). my time shackled by theirs. This poem uses actual names of ravens in the Tower of London. (Ravens are excellent mimics). Sally Long is a teacher and postgraduate Creative Writing student at the universities of Newcastle and East London. Her poems have been published in Ink, Sweat and Tears and South. extraño como los besos en los despachos. out of place as kisses in an office. errante como el aroma de Primavera. elusive as the scents of spring. confuso como la muerte frente al espejo. confused as Death reflected in a mirror. vacío como un diario sin crucigrama...                                         empty as my daily paper with no crossword …. Y yo siempre tan solo y tu siempre tan lejos. and desolate as I am always while you stay away. His wife has the most sunlight and the darkest look. in the folds of her black dress. She's all angles, wiry hair pulled from her face. the bag on her lap big enough to cover her heart. the relaxed image of being in good company. choosing what he wants us to see. Emma Lee’s collection Yellow Torchlight and the Blues was published by Original Plus. She blogs at http://emmalee1.wordpress.com and regularly reviews for The Journal and Sphinx. Bruce Christianson is from Whangarei, in New Zealand. After training as a mathematician he has spent twenty-five years teaching in Hertfordshire. Death knows where he is. David Cooke won a Gregory Award in 1977 and published Brueghel’s Dancers in 1984, but then stopped writing for twenty years. His retrospective collection, In the Distance, was published in 2011 by Night Publishing. A new collection, Work Horses, will appear in 2012 from Ward Wood Publishing. George/ Teoti Jardine, was born in Queenstown, of Maori, Irish and Scottish descent and has been writing poetry off and on most of his life. He has had poems published in Te Panui Runaka, the Burwood Hospital News Letter and the Christchurch Press Poetry section. But I ask you - call this spring? What with all them blooming flowers. Just trying to make a living. smiles at their psychedelic escape. The door is open to the sky behind them. gifts two birds to his ailing daughter. throws birds to the air, his tears streaming. Roy Marshall is based in Leicester and has only recently begun to send work to magazines. He has had work accepted by The Rialto, Magma, Staple, Smiths Knoll, The Shop and elsewhere. His pamphlet Gopagilla will is published by Crystal Clear Creators in 2012. A tickle in the throat announces flu. Three days, too long to try to fight it off. Thirty days to pay off all the bills. Three hundred to be born, and more to die. The idle moments are the ones that count. from once and future tears. Andrew Shields lives in Basel, Switzerland, and teaches in the English Department at the University of Basel. His poems and translations have been published worldwide. His most recent book publication is A Matter of Wonder (Karger, 2011), a collection of science essays by Gottfried Schatz, translated from the German. How loud those small birds sing. in the fountain’s mosaic bowl. and his rusting cab will be here. now, Madame? as if I really knew. Angela Kirby was born in Lancashire and now lives in London. Her poems are widely published and have won a handful of prizes. She was the BBC’s Wildlife Poet of the Year in 1996 and 2001. Her two collections, Mr Irresistible and Dirty Work, are published by Shoestring Press. Mirrors have a heart of stone. they unearth nothing but doubt. low enough, my lips enough, my shoes, my bag? even with her 20/20 vision. But mirrors are harder than stone. from memory as soon as it turns. embellish, stand by in this world and the next. for traces of an ancient world. an ear, and holds it to her own. ‘There’s nothing left,’ a local said. a bench beside the Evenlode. all stilled, as in a daydream pause. is something more than just a name. and look at rose hips, and blue flies on leaves. I was walking there and it was September. and September was as it usually was. that was leading me round a bend in the lane. across the field at something or anything. and began to pick its steps through the grass. and launched overhead in a clapping arc. and its gaze fell from pigeon to me. and gnats brought news of the following day. Robert Etty was born in Lincolnshire, where he still lives. His poems have appeared in a range of magazines and his most recent collection is The Horncastle Executioner, published by Nunny Books of Grimsby. by a coalescence in the score? Chris Jackson lives in Hackney and works as a journalist. Over the last few years, his poems have appeared in many magazines and sites including Ambit, Equinox, The Interpreter’s House and Ink, Sweat & Tears. He reads regularly at London venues. An e-chapbook The Monkey Fragment is forthcoming from Silkworms Ink. I'll never want to lose to you. "Go on! Go on! That was so good!" I'll go with them to the can. Excellent and thought provoking poems. I particularly enjoyed Waiting for Muhommed and Myths of London’s Parakeets. But all great poems Mike and thanks for your choices! How interesting to have so many bird poems in one edition. Thank you Wendy! I’ve found it very intriguing that in each of “my” issues of London Grip New Poetry so far a theme has emerged spontaneously from the diverse contributions by many different poets. I wonder if this can continue….